Gary Burton is an American jazz vibraphonist. Jazz musician and Percussive Arts Society Hall of Famer Gary Burton has spent more than three decades playing the vibraharp and is credited with both revolutionizing the instrument's sound and broadening the jazz audience as a whole. While he was still in his teens, the budding musical innovator adopted the use of additional mallets--traditional vibraharps make use of only two--to maximize the xylophone-like instrument's lush vibrato and resonance. The two-time Grammy Award winner then pioneered the fusion movement in the middle 1960s when he integrated pop devices, folk, country, and rock rhythms with jazz. Born January 23, 1943, in Anderson, Indiana, Burton began music lessons at an early age upon the insistence of his parents, who wanted all of their children to study an instrument. Intrigued by one particular instrument's size and method of play--namely, the use of mallets to create its rich sound--the six-year-old Burton chose the marimba. However, his venture into music seemed ill-fated when he refused to budge from his seat at his first lesson. Upon returning home with his mother, he begged her to let him try again and within a short time mastered both the marimba and the more modern vibraharp. Soon Burton was adapting both piano and violin music for his instruments. By the age of eleven, he was performing around his hometown of Princeton, Indiana, with a band that consisted of his father, brother, and sister. Four years later, when his piano teacher loaned him an Erroll Garner record, Burton developed a serious interest in jazz. In 1959, at the age of sixteen, Burton attended the first summer jazz band camp at Bloomington, Indiana, and decided on the spot that he wanted to be a professional musician. On graduating from Princeton High School in 1960, Burton planned on entering the Berklee School of Music in Boston but was sidetracked by a chance to play gigs in Nashville. As a teenager, Burton had met Yakety Sax man Boots Randolph. A mentor to Burton with close ties to Nashville, Randolph introduced the budding musician to Hank Garland, who then asked Burton to join him playing clubs and recording in Nashville that summer. "That one sojourn to Nashville was more of an aberration than anything else," Burton said in the High Fidelity profile. By 1961 Burton was anxious to leave for Boston, where he studied jazz at Berklee and classical composition at the Boston Conservatory. Primarily self-taught, Burton had already perfected a four-to-six mallet vibe playing technique at a time when two mallets were standard. Boston was as intrigued as Nashville had been by this innovation, but Burton spent only two years at Berklee and the Boston Conservatory before heading to New York in 1963. He joined pianist George Shearing's quintet in New York and soon learned that working with seasoned professionals would expose his shortcomings as a soloist. Burton's next apprenticeship came when he joined tenor saxophonist Stan Getz a year later. Since Getz had popularized the bossa nova blend of jazz and Brazilian folk rhythms with his 1964 hit The Girl from Ipanema, Burton received television and movie exposure while playing at important jazz festivals, concerts, and clubs. By 1965 his visibility netted him Down Beat 's Talent Deserving Wider Recognition Award. In 1967 Burton formed his own band with guitarist Larry Coryell, bassist Eddie Gomez, and drummer Joe Hunt, breaking several jazz precedents. As improvisor and composer, Burton opted for a repertoire of both original compositions and jazz standards. As his band incorporated new and old material, the players shed the universal suit and tie attire of jazz artists. The younger market responded when Burton released Duster, which became the forerunner of the fusion movement in 1967. Successful since his debut, Burton has been named top player on vibes in numerous Down Beat readers and critics polls. He won his first Grammy Award in 1971 for Alone At Last, a recording of his solo performance at the Montreux Jazz Festival that same year. His second Grammy followed in 1979 for best group performance on the album Duet, with keyboardist Chick Corea. Burton has worked with a long list of other legendary jazz artists as well, including Stephane Grappelli, Steve Swallow, "Tango Destroyer" Astor Piazzolla, Keith Jarrett, Ralph Towner, Jerry Hahn, Mick Goodrick, Pat Metheny, John Scofield, and Peter Erskine. "Without sacrificing the energy or the poetry of his playing," wrote Ron Givens in Stereo Review in 1989, "Burton has made music like an insatiable scholar." Burton and his wife, Cricket, raised two children while he was performing, teaching, and recruiting musicians. (With Stephane Grappelli) Paris Encounter Atlantic, 1970. Alone at Last Atlantic, 1971. (With Steve Swallow) Hotel Hello ECM, 1974, reissued, 1992. Dreams So Real ECM, 1975. Easy as Pie ECM, 1980. Gary Burton and the Berklee All-Stars JVC, 1985. Times Like These GRP, 1986. Real Life Hits ECM, 1987. (With Eberhard Weber) Ring (recorded 1974), ECM, 1987. (With Paul Bley) Right Time--Right Place GNP/Crescendo, 1991. Green Apple (recorded 1969), Moon, 1992. (With Eddie Daniels) Benny Rides Again GRP, 1992. In the Public Interest Polydor. (With Keith Jarrett) ... And Keith Jarrett Atlantic. (With Stan Getz) Getz au Go Go Verve. (With Astor Piazzolla) The New Tango Atlantic. With Chick Corea Crystal Silence ECM, 1972. Lyric Suite for Sextet ECM, 1993. In Concert: Zurich (recorded 1979), ECM. With Ralph Towner Matchbook ECM, 1974. 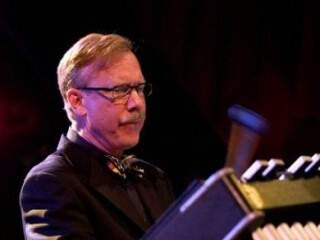 View the full website biography of Gary Burton.